PetroSA, BASF, Umicore Catalyst SA, and Heraeus South Africa awarded 12 bursaries to students who will study toward a Diploma in Chemical Process Technology, a three-year Diploma at Nelson Mandela Metropolitan University. The Chemical Process Industry, which includes gas and oil production and refining, metal processing and the production of many industrial and household products, is responsible for more than 20% of South Africa’s manufacturing gross domestic product. This course was developed to cater for the need in industry to develop skilled process operator and controller technicians that will not only controlled the process plant but also support chemical and process engineers in various design and problem solving projects. Therefore much emphasis has also been placed on communication skills, teamwork and an understanding of process economics in view of the criticality of many of the role of the chemical process technician in a wide range production facilities. NMMU and InnoVenton also wishes to acknowledge the support and facilitation in the development of course material and the generous donation of training plant equipment by PetroSA, which will be used as part of this new Diploma Programme. 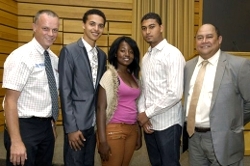 Shawn Gouws (left) and Petro SA’s Darrin Arendse (right). PetroSA sponsored six of the bursaries with another six sponsored by BASF, Umicore Catalyst SA, and Heraeus South Africa. Altogether 22 students of whom 11 are women, two students are from Nigeria and Limpopo each and one from the Kongo have registered for the programme.